← Bolivian Businessmen declared emergency against evo’s demagogue! 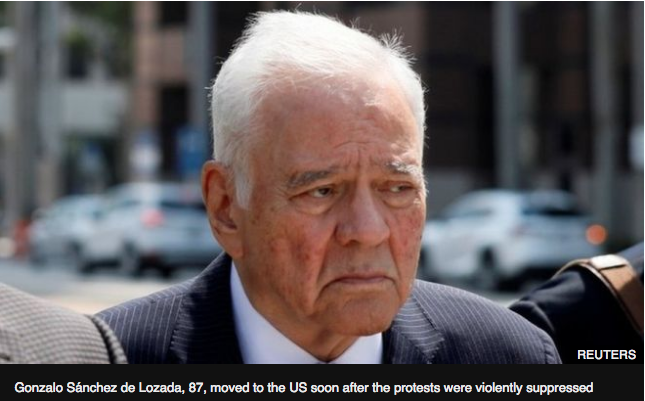 A US judge has overturned a ruling that held former Bolivian President Gonzalo Sánchez de Lozada responsible for the deaths of dozens of protesters. Plaintiffs in the civil suit had accused the former leader and his defence minister, Carlos Sánchez, of ordering the Bolivian military to use force to break up protests in 2003. The judge said the evidence presented to the jury had been “legally insufficient”. The plaintiffs said they would appeal. The lawsuit was brought by a group of families whose loved ones died during demonstrations in the Andean country against plans to export natural gas from Bolivia to the US. In an incident that became known as the “October massacre”, at least 67 people were killed and more than 400 people were injured when soldiers opened fire during the protests in the city of El Alto, near La Paz. Mr Sánchez de Lozada and Mr Sánchez moved to the US shortly after the violent suppression of the protests and have been living there since. The case was brought under a law that permits civil suits in US courts for extrajudicial killings. Following a three-week trial, the jury found the two men “responsible” of the deaths of the protesters and awarded the victims’ families $10m (£7m) in damages. But lawyers for Mr Sánchez de Lozada and Mr Sánchez submitted a motion asking the judge to dismiss the jury’s decision on the ground of insufficient evidence. Mr Sánchez de Lozada welcomed the judge’s decision in a letter, saying that it “demonstrates that there was absolutely no evidence that indicates the existence of a plan or order to use lethal force against civilians”. Lawyers for the families of the victims said they would appeal “immediately” against the judge’s decision. “We don’t think we have lost, this is only a hurdle,” lawyer Thomas Becker said. This entry was posted in Bolivia, Crime and Violence, Politics, Social Unrest and tagged democracy in peril, government failures, police brutality, violent aggression. Bookmark the permalink.